Taylor Swift will be comforted by the fact that this is the stuff country songs are made of; the singer's recent ex, Joe Jonas, is reportedly already cozying up to actress Camilla Belle. 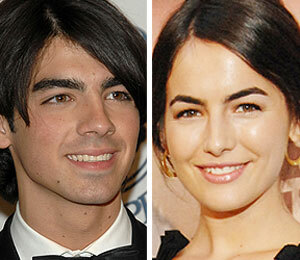 The "10,000 BC" actress met the 19-year-old "Burnin' Up" singer on the set of "Love Bug." "They met on the set of his music video," a source tells People magazine. "All the guys always had thought she was really pretty and that's why they asked her to be in it." Joe and Camilla reportedly plan to keep their relationship hush-hush. "They are not public about it, but they've just been hanging out with their friends and Joe's brothers," the source reveals. "They are very private about it." The source added about Belle, "She's a really good girl and it seems they share a lot of the same characteristics and morals." Reps for Joe and Camilla had no comment.